The deal of the month at Sew Sisters Quilt Shop is Wonder Clips! If you want a little of many fabrics - say for a scrappy quilt or pillow, Becca from Sew Me a Song is making the most fantasic bundles, including this Colour me Blue fat 16th bundle. The Fat Quarter Shop has exclusive 12 wt Aurifil thread sets (10 spools of 54 yards each), perfect for hand quilting. This is the Macaroon Finishing Set. Congratulations to Green Fairy Quilts for 7 years in business. They are sharing the party, use discount code 7YEARS for great discounts! Mad about Patchwork has extended their summer sale to the end of the month! Use the coupon code HEATWAVE for 20% off selected fabrics, click here. 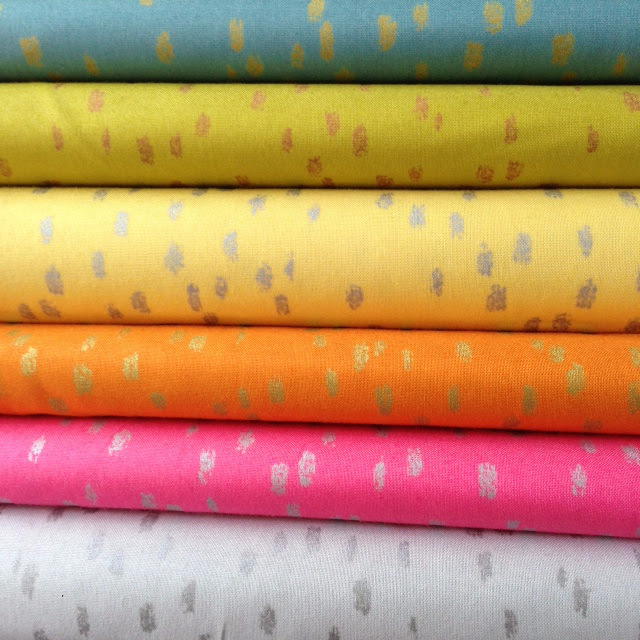 This sale has fabrics from Kate Spain, Carolyn Friedlander, Cotton + Steel and others. The Autumn colours at Oakshott Fabrics are beautiful, check out the project links on the Oakshott Shotthrough Blog. Fabric Spark has more new fabrics, including Heavy Metals from Windham Fabrics. More unpacking today, and a bit of cleaning too, but the sun is shining and it is not too hot, so off I go. Enjoy your day!